Make serving drinks and bulk treats quick and easy with this 15 oz. white plastic scoop! Perfect for scooping ice, candy, nuts, cereal, flour and other bulk items, this plastic scoop easily reaches into ice buckets and containers of bulk products to make serving simpler. Its compact lightweight design makes this scoop ideal to carry with smaller ice buckets. Great for measuring out ice for smoothies or filling a glass for drinks on the rocks, this plastic scoop will grab just the right amount of ice rather than dunking your glasses into the ice bin, extending the life of your glassware. This item has a cheap feel to it. When you scoop, the plastic bends and moves, which makes it difficult to use. Wouldn’t buy again. 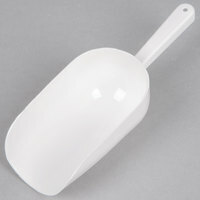 This large white scoop is exactly as described. It is made if hard durable plastic and should last awhile. It also is very easy to clean. This is exactly what you'd expect in a 15oz white plastic scoop. We use it for sugar, flour, coffee, and all of the other things one might scoop. Excellent scoop for front of house drink stations. We have had zero issues so far with this product. Plastic makes it more likely to break, but it hasn't. This scoop was a little more flimsy than I would like. I was gonna use it with lentils, but the scoop handle had more give and bend than I would prefer. I may have to find something with less weight to use this scoop with. Otherwise, the size is nice for scooping out large amounts of lentils at a time! This scoop works fine but is not as rigid as the larger (32 oz) white plastic scoops I bought. While it would be great for moving light stuff like spices or popcorn, it's less useful for moving denser, heavier materials. Use these for my bulk dry products (flour, sugar, etc.). Holds weight when scooping a lot of one product. Easy to clean. Handle is easy to grab. I love this strong scoop. It is just the right size and it really comes in handy for transferring flour from one container to another. The 15 oz. White Plastic Scoop is great for scooping the popcorn into our cups. It doesn't take much time at all with the size. The quality is good and the price is as well. Definitely recommend! Great scoop for the money! I don't use it for ice. I bought these for a wedding that used them for a popcorn bar. They worked really well! We use these for scooping dry goods, so this does what it is supposed to. Not glam like the stainless steel, but stands up to use and washing. This scoop is super cheap. It does show in some places, but it's pretty great overall. A tad flimsy, but it works very well when I'm scooping rice. I purchased this for flavoring coffee and it does exactly what I needed at a fraction of the price of other scoops I priced. Would recommend. As simple as it is, this is perfect for so many things! Its far better than a metal scoop for ice, and also works great to get a scoop of flour out of the 25# bag. This is a large scoop perfect for baking ingredients such as flour or sugar. Whatever items you use a lot of in recipes. Great quality and built to last as the plastic is strong. I think for the price, this is a great product. It serves its purpose well. I would have liked it to be sturdier, but works perfectly. Perfectly affordable scoop option for bulk ingredients - I've been using them for flour, sugar, brown sugar etc without any issue. Plastic feels lightweight but I haven't had an issues. This white scoop is perfect for ingredient bins it is just the right size at a affordable price. I bought several so you always have a backup. Good dry ingredient scoop. For the price I can't really complain, but with light use its handle separated after about a year and I needed a replacement. Cleans well. This spoon is great and very large. I use mine for scooping out sugar and I leave it inside the container for easy storage. It is durable. You can also use the 15 oz. White Plastic Scoop to transfer dog food from the bulk bag to your bucket. It is such a nice size and when done we can just leave in the bucket to use for later. You can't go wrong with these 15 oz. White Plastic scoops. We use ours to transfer chips and crackers to serving bowls while keeping our hands out of them while we work. Excellent quality. I use to to scoop the right amount of popcorn for elementary students. I don't think I'd want to use it for heavier ingredients, but AWESOME for popcorn! For the price, it does its job and is a fine buy. I mean it's not like it has to do a whole lot other than scoop ingredients. I only gave a 4/5 though because of the material, plastic is a bit thinner than I would like and in theory might not work great for heavy or semi solid ingredients as I could easily see it bending or warping. Thus far I haven't had any issues though. Great scoop used for ingredients in our bakery / deli. Good quality and I don't feel like it is going to break if I lift a lot of flour or brown sugar with it. We purchased bulk items from WEB.COM dry beans, pretzels, sugar,etc. We put them in white containers with lids, but also add this 15 oz white plastic scoop in each of the containers. It sure makes it a lot easier to scoop what you want from each container without getting it all over the floor or counters. They are very sturdy and takes out the right amount you need. The price is fantastic and washing up is a breeze. I also found out they are very useful for children or grandchildren to use in the sandboxes.Buy one for each child and no fighting between them. What you paid and what you get. This plastic scoop is very cheap. I need to pay more to get nicer scoop, so it will do job. It is just so thin and weak. Thank you for your review, Sam! We are sorry the scoop did not hold up for you. We recommend this One Piece Flat Bottom Aluminum Scoop aluminum scoop for a heavier duty alternative. I use this product in my flour bin. It is very durable and the plastic material is very easy to clean. Best price I could find on the internet. Big scoop, strong handle - exactly as pictured. Handles big loads of flour and ice and even at one point dried beans with no breakage or cracking in handle. Paired with a good balance, these plastic scoops make measuring in large quantities a breeze. The white finish is attractive and easy to clean / maintain. I purchased several of these scoops for use at my daughter's wedding. The bar tenders and kitchen staff said they worked great for scooping ice into pitchers. Great price too! This scoop is good for working in a bakery, or any place you handle lots of ingredients. It is good quality, and it is versatile. we have the big stainless scoop for our ice machine, but we need a smaller one for bar ice bin. this comes out right size. The scoop with so many uses. I love it and all the sizes the carry beside this one. I would recommend this product to anyone. I'd been looking for the right size scoop for dog food actually and this fit the bill, as I was ordering other kitchen items as well. I love this store! Love this scoop!! All I need to do is use one full scoop to make a 16 oz. smoothie. It is durable and stands up under pressure. I bought these to use with the 22 qt food storage containers for my flour, sugar and rice. They make easy work of refilling my countertop cannisters and the price is great! Scoops are perfect for food applications. They are the best buy for the money that I have found in stores or on the web. Great deal.